The Bible had stated it clearly that in the end of times, many so called prophets would claim to perform miracles but that many of such would be fake. It is therefore, a fulfillment of that prophecy going by the antics of most men of God these days or how would one describe the shocking development where cans filled with what is described by the labels as the 'Blood of Jesus', being sold to people? 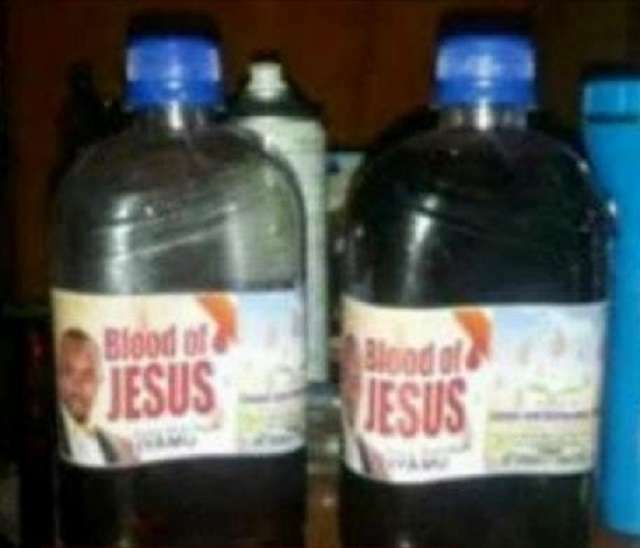 The outrageous photos of plastics cans labelled 'Blood of Jesus' has been making the rounds and causing resentment on social media after it emerged. The substance is reportedly being sold by a pastor in Ghana, to many miracle seekers who throng his church to make purchases. It was gathered that according to the pastor, the 'Blood' cures every manner of sickness and sells for between N4,000 and N7,000.